The recent progress in cognitive neuroscience, and the importance of genetic factors and gene-environment interactions in shaping behavioral functions in early childhood, have both underscored the primacy of early experience and development on brain development and function. 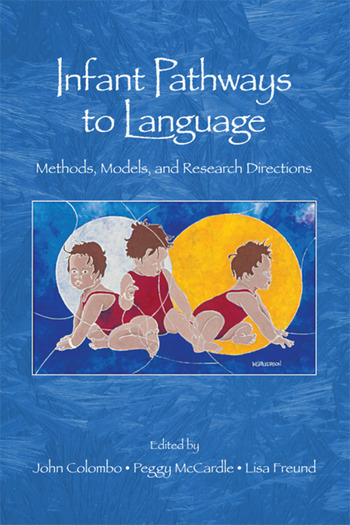 The contributors to this volume discuss different paradigms and approaches in infant language and cognition, pushing the frontiers of research by innovatively combining methods, introducing new measures, and demonstrating the use of technologies and measurement approaches that can inform the study of word learning and categorization, gaze, attention, gesture, and physiological functions. The volume offers a blend of theories and empirical evidence to support, refute, or modify them. Most chapters examine the link between theory and methodology, and their appearance together in a single volume serves to inform and engage multiple disciplines, to engage everyone to think across disciplines and paradigms, to embrace the integration of creativity and science as the field continues to study in greater depth and with innovative measures and approaches, the infant pathways to language. The volume is essential reading for a wide range of students, researchers, and professionals with an interest in infant cognitive and language development. Introduction. P. McCardle, J. Colombo, L. Freund, Measuring Infant Language. Part 1. Recognizing Patterns. R.N. Aslin, E.I. Newport, What Statistical Learning Can and Can’t Tell Us About Language Acquisition. J.R. Saffran, Acquiring Grammatical Patterns: Constraints on Learning. L. Gerken, Are Infants Constrained in Their Linguistic Generalizations? Some Theoretical and Methodological Observations. M. Rice, How Different is Disordered Language? Part 2. From Patterns to Meaning. J.F. Werker, C.T. Fennell, Infant Speech Perception and Later Language Acquisition: Methodological Underpinnings. S. Waxman, How Infants Discover Distinct Word Types and Map Them to Distinct Meanings. J.S. Deloache, P.A. Ganea, V.K. Jaswal, Early Learning Through Language. Part 3. Predictors of Language Emergence. J. Colombo, D.J. Shaddy, O.M. Blaga, C.J. Anderson, K.N. Kannass, W.A. Richman, Early Attentional Predictors of Vocabulary in Childhood. A.N. Meltzoff, R. Brooks, Social Cognition and Language: The Role of Gaze Following in Early Word Learning. S. Goldin-Meadow, Using the Hands to Study How Children Learn Language. Part 4. Models and Methods to Study Infant Language. P.K. Kuhl, Linking Infant Speech Perception to Language Acquisition: Phonetic Learning Predicts Language Growth. L.B. Cohen, J. Brunt, Early Word Learning and Categorization: Methodological Issues and Recent Empirical Evidence. G. Marcus, H. Rabagliatti, Language Acquisition, Domain Specificity, and Descent with Modification. L. Freund, Neuroimaging Tools for Language Study. Finale. P. McCardle, L. Freund, G. Marcus, Pathways to Infant Language Research: Commentary and Future Directions. John Colombo is at the Department of Psychology at the University of Kansas. His major research interests are in the developmental cognitive neuroscience of attention and learning in infancy and early childhood, with a special focus on early individual differences in these areas and how they relate to childhood intellectual function and developmental status. His secondary research interests include auditory development, the organization of sleep-wake states in infancy, and the effect of early experience on central nervous system and behavioral development. Peggy McCardle, Ph.D., M.P.H., is the Chief of CDBB and directs the Language, Bilingualism, and Biliteracy Development and Disorders Program and the Reading, Writing and Related Learning Disabilities research programs. Dr. McCardle holds a bachelor's degree in French, a Ph.D. in linguistics, and a master's degree in public health. She has been a classroom teacher and a speech-language pathologist, and has held university faculty positions at South Carolina State College, the University of Mississippi, the University of Maryland, and the Uniformed Services University of the Health Sciences, and hospital-based clinical positions at Womack Army Community Hospital, Ft. Bragg, North Carolina, and at Walter Reed Army Medical Center, Washington, D.C. Her publications address various aspects of public health and developmental psycholinguistics (e.g., language development, bilingualism, and reading). She was the NICHD liaison to the National Reading Panel, currently serves as liaison to the National Institute for Literacy, and leads or serves on various inter-agency working groups. She co-edited The Voice of Evidence in Reading Research (2004, Brookes Publishing), which presents information about reading research and its findings, for educators, administrators, and others concerned with getting research results into the classroom, and Childhood Bilingualism (2006, Multilingual Matters), which addresses research issues in the development of bilingual language abilities, as well as various thematic journal issues on these and related topics. Lisa Freund, Ph.D., Child Development & Behavior (CDB) Branch, of NICHD, is a developmental psychologist and cognitive neuroscientist who is known for her neuroimaging studies of children from different clinical populations; she was an NICHD-supported scientist for several years. She has extensive training and experience in the fields of developmental neuroscience, developmental psychology, learning disorders, and behavioral and molecular genetics. Dr. Freund received her Ph.D. from the University of Maryland in applied developmental psychology and was an associate professor of psychiatry at the Johns Hopkins University School of Medicine and Kennedy Krieger Institute. As part of the CDBB, Dr. Freund is responsible for a multifaceted research and training program that promotes basic and applied to gain a deeper understanding of the linkages among genes, the developing brain, and behavior.